We run a youth club for children between 5 & 10 yrs of age on a Thursday evening between 4.30pm and 6pm during term time at Ramsey Cricket Club, Cricketfield Lane, Ramsey. The club has fully qualified staff and volunteers and offers a wide range of activities. Ramsey Neighbourhoods Trust has provided support to the Ramsey Million BOSH (Bring On Summer Holidays) playscheme since 2013. The aim of the project is to provide afforadable summer activities for children aged between 5 and 10 yrs. The 2 week scheme runs during August and has made its home at Ramsey Cricket Club. The scheme is manned by fully qualified staff and provides exciting activities and visits for just £2 per child per session. Past activities have included archery, samba drums, sea-side trips, climbing wall, cricket, dodgeball, theatre make-up and much, much more. This year our theme was a ‘Walk on the Wild Side’. We are delighted to announce that this year we had a record attendance with many sessions SOLD OUT. 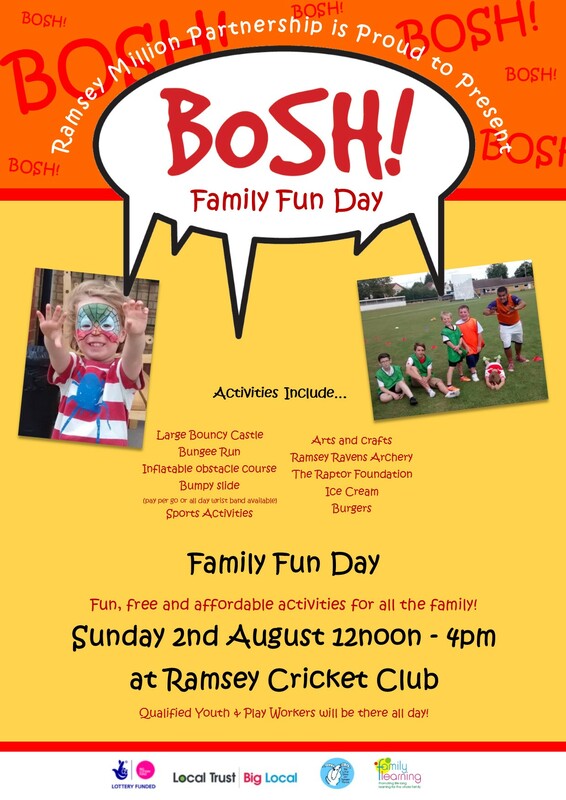 For more pictures and info visit the BOSH – Ramsey Facebook page.